Gromov, Aleksandr. Islandskaya Karta . Eksmo 2006. What if: There were no American continents. Series note: Duology of Islandskaya Karta and Russkii Arkan . Published: In one volume as Islandskaya Karta - Russkii Arkan , Eksmo 2009 (9785699358915). Summary: Thriller set in the 21st century of an Earth dominated by European great powers. 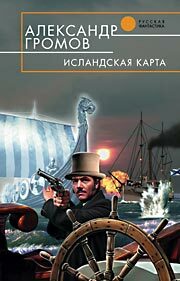 A bureaucrat accompanies the heir to the Russian throne on a voyage west across the great ocean to Japan, fighting off British intrigues and Icelandic pirates. Series note: First of the Islandskaya Karta duology. Published: Eksmo 2006 (5699171746w88 android). Series note: Second of the Islandskaya Karta duology. Published: Eksmo 2007 (5699247025w88 androidBUY), 2009 (5699358919BUY).